Already own a home in the Magnolia Commons subdivision? Thinking of selling? Click here and read about current search trends & our web network. Magnolia Commons homes for sale in Fairhope, Alabama are all listed on this page and along with the current listings, an interactive Google map, pictures, property details, and other helpful sales info for the homes in Magnolia Commons in Fairhope. This community in Fairhope offers cottage-style living at its best. 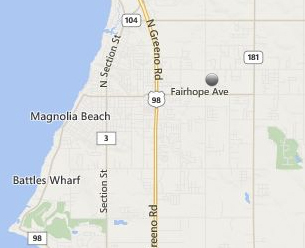 This Fairhope neighborhood was established in late 2012 and consists of a variety of floors plans from D.R.Horton. Find a Fairhope cottage to fit your family's needs, with three to five bedrooms, two to three bathrooms, and square footage being 1,270-2,200. Magnolia Commons in Fairhope provides underground utilities including natural gas and energy saving features such as SEER 13 HVAC. From Highway 98 in Fairhope, head east on Highway 48 (Fairhope Avenue), then take a left on Highway 13 (Oberg) and Magnolia Commons will be on the right. The Alabama Gulf Coast's beaches are approximately 40 minutes from the subdivision and the closest airport is located in West Mobile, AL and takes under an hour. (If you need further info, have questions or would like to schedule a viewing for any of the homes for sale in Magnolia Commons or any other properties in the area, please email info@condoinvestment.com or call (251) Area-Pro (251-273-2776) for immediate assistance.